Pork Giniling is a very basic and simple pork dish that makes use of ground pork as the primary ingredient. 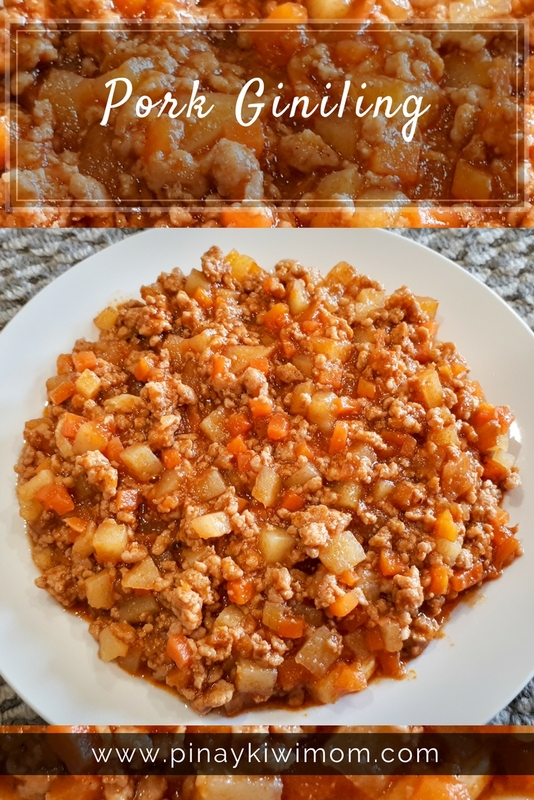 This recipe involves sautéing the ground pork and stewing in tomato sauce and water to bring out the taste while vegetables such as carrots and potatoes are added for additional flavor and nutrition. Heat cooking pot and pour in cooking oil. When oil is hot enough, put in garlic and sauté until the color turns light brown. Add onions and sauté until texture becomes soft. Put in ground pork and cook for 5 minutes. Add pork or beef cube, tomato sauce, and water and let it boil. Simmer for 20 minutes. Put carrots and potatoes in then stir until every ingredient is properly distributed. Simmer for 10 to 12 minutes.